Panthertown Valley might not have any panthers anymore, but it feels about as wild as a big cat on the prowl. 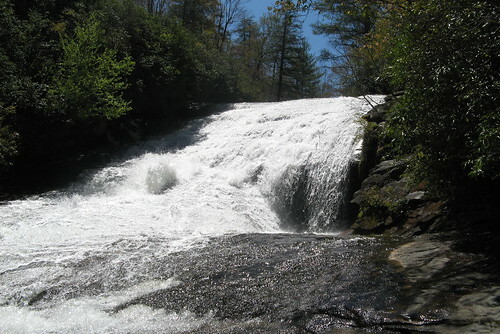 The valley is a 6,295-acre swath of Nantahala National Forest in the far southwest corner of North Carolina about 70 miles southwest of Asheville. The hiking’s fine all year, but it’s especially fine in the springtime, when seasonal rains create gushing waterfalls that tempt comparisons to Yosemite. The abundant falls and exposed granite walls have at least a whiff of Yosemite’s grandeur, though a tangled forest canopy obscures most of the vistas. A spiderweb of named trails and unnamed footpaths makes navigation is a crap-shoot if you don’t have a map; even with a GPS unit, it’s easy to get lost. Fortunately, a local wilderness guide sells a top-grade map (“A Guide’s Guide to Panthertown“; I ordered mine online from a bookstore in Cashiers, a few miles down the road from Panthertown ). It was worth every penny. Panthertown is a 200-mile drive from Winston-Salem, putting it at the far edge of doable in a day hike for folks in the Triad. Best to take a few friends to divvy up the cost of gas. This time out I had a co-hiker, who posts under the handle CBHiker6 at EveryTrail.com. 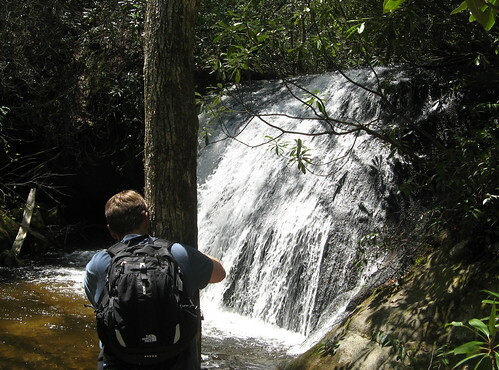 Chris has lived most of his life in Winston Salem and gave up golf for hiking a couple years back — how can you not admire a guy who made that swap? We’ve been following each other’s travels on EveryTrail for months and finally got around to lining up a hike. 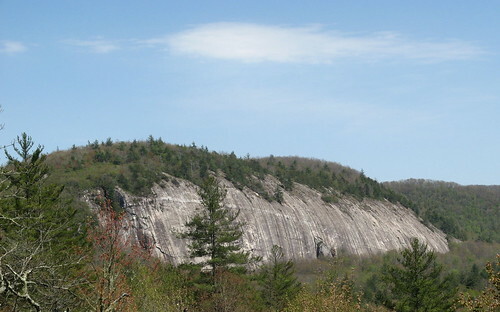 A view of Panthertown Valley not far from the trailhead. Note if you go this way: you’ll see a trail sign pointing to Wilderness Falls — a stately waterfall with a steep, descending trail next door. Better to craft a loop so you can see these falls on the return trip. It’s a tough climb, for sure, but coming down a trail that steep is downright scary. 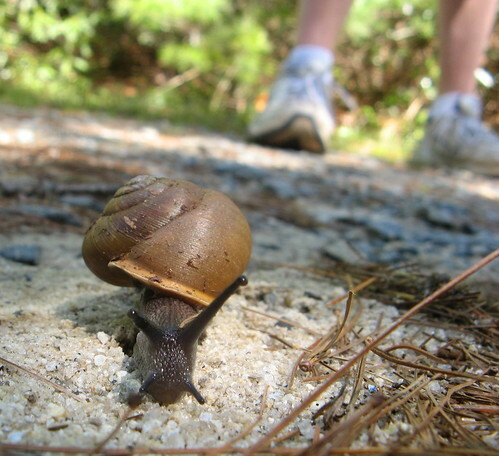 Chris has a keen eye for the critters; he spotted this snail along the way. 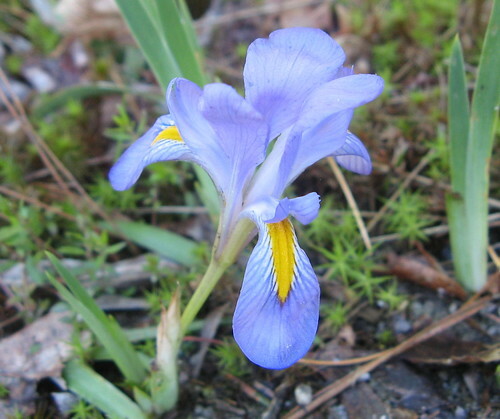 He also spotted this iris. We ambled down Panthertown Valley Trail till we hit a junction with North Road Trail, which we stuck with till it intersected with Power Line Trail; from there it was left turn and a short stroll to an unmarked single-track on the right. Without my map, we’d have never known this is the turn-off to a string of lovely waterfalls, starting with Warden’s Falls, below. Mind you the trail’s very narrow and root-infested and it takes an alert eye to stay on the path. With a modicum of exploring you can find the top section of the falls (shown in my very first photo) and wander down the base of the falls. The map shows a trail to more a few more waterfalls downstream, but we missed the turnoff and did more bushwacking than we’d care to talk about before we threw in the towel and headed back the way we came. 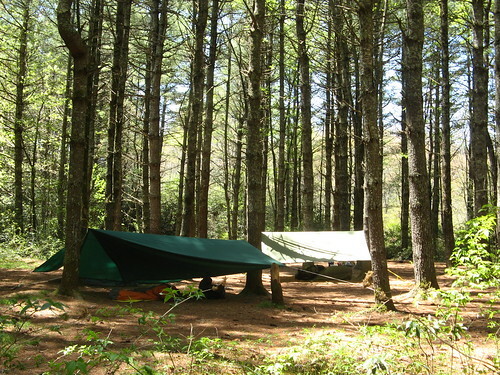 We found our way back to Panthertown Valley Trail, wandering through several excellent campsites along the way. I can see why people go to the trouble to track down this place. 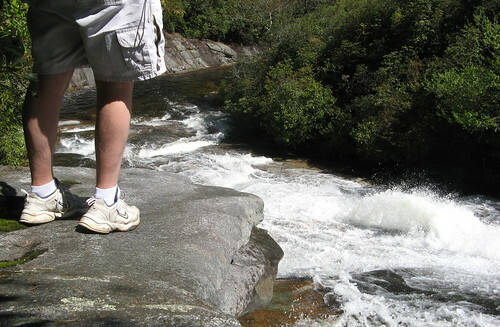 We set our sights on loop that took in a few more waterfalls before returning to the Salt Rock Gap. From Panthertown Valley Trail, a left turn down Mac’s Gap Trail leads to the turnoff to Granny Burrell Falls; we followed a nice unmarked path shown on the map that cut the distance short. The trail to Granny Burrell Falls is narrow single-track with dense vegetation. Interesting hiking, though the falls (below) were not super impressive. 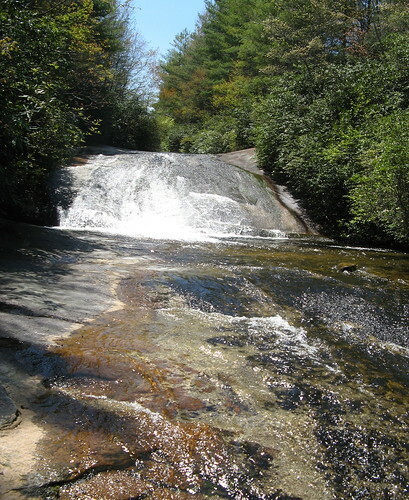 The last two falls were Frolictown Falls and Wilderness Falls. You’d never find these without the map, either. Chris hasn’t gone tree-hugger on us just yet (though I expect he’s getting greener with every hike). He’s just going to some lengths to get a picture of Frolictown Falls without that tree in the middle. If you find Frolictown Falls, you’ve almost found Wilderness Falls: the sign pointing to the trail up to Wilderness Falls is nearby. 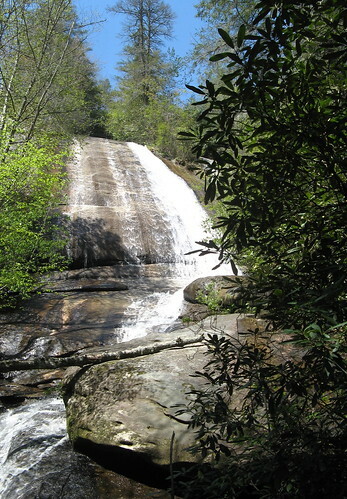 The climb to the base of Wilderness Falls is a bit steep; once you see how tall the falls are, you realize a lot more climbing’s in store. 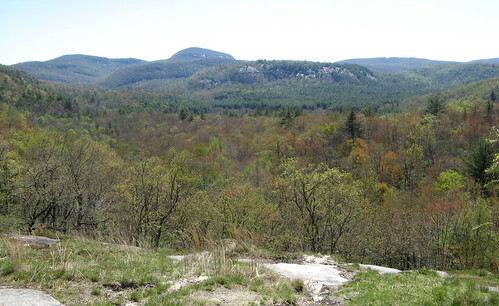 A steep slog not far from the trail opens onto a clearing that is a natural resting spot. There’s also three paths, none of marked. Going left takes you into a “no trespassing” sign that politely alludes to the use of firearms nearby. Going right takes you to a pretty valley overlook, below. Going center takes you back to Panthertown Valley Trail, where it’s a left turn and a short walk back to the car. This hike is a mere hint to all that’s happening in Panthertown. I can’t wait to get back there and explore some more. Trail system map (PDF download). Great find! How long did this hike take you? I think we hiked for about four hours or so. This is a wonderful hiking locale; the pix don’t do it justice.